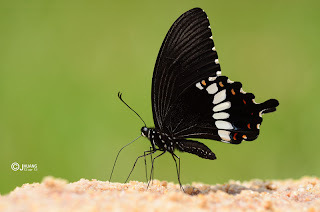 The Common Mormon is a relatively common butterfly in Singapore. This swallowtail is found in urban parks and gardens, although it is fairly often seen in forested areas as well. Its caterpillars feed on the cultivated Murraya koenigii or Indian Curry Leaf, as well as another wild grown species of the same genus. Other Citrus plants are also known host plants. The upperside of the Common Mormon is predominantly black with a series of whitish spots running across the hindwing forming a band. The female is polymorphic with the form-polytes mimicking the Common Rose, presumably for protection against predators. Males of the species are often encountered puddling on damp sandy streambanks which have been tainted with decomposing organic matter. When puddling, the forewings of the butterfly flap rapidly, whilst the hindwings are held still. 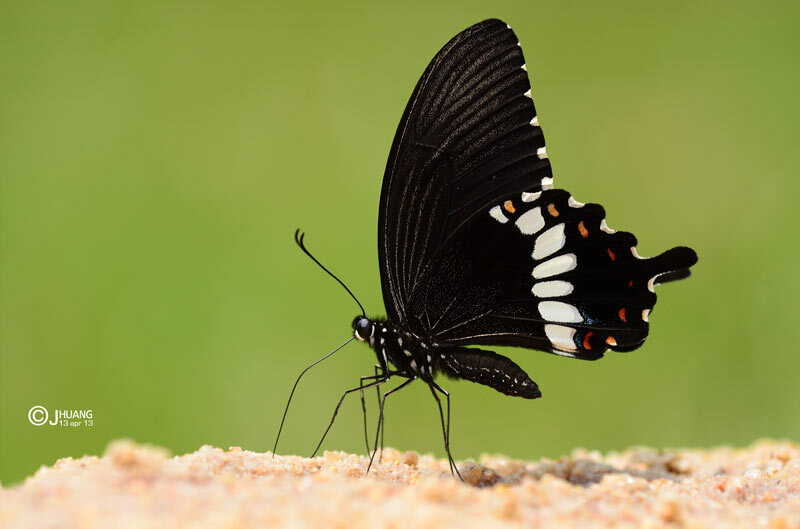 This shot of a puddling Common Mormon was taken at a park connector near a nature area by ButterflyCircle member Huang CJ, who managed a sharp shot of the Common Mormon whilst achieving a smooth green background which contrasts pleasantly with the black wings of the butterfly.